Milplast Big size plaster is ideal for oversized wound care. The plaster is produced as cut-off tape and can be easily cut into pieces of desired length or used for continuous dressing fastening. The plaster elasticity allows its application on any skin area. 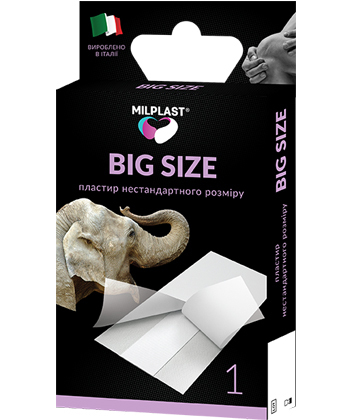 Milplast Big size can be removed easily and painlessly, without remains on the skin. - Viscose sorptive pad with protective mesh preventing wound adhesion. 1. Remove contaminations and liquids from the wound and surrounding skin. 3. Remove protective paper strips and tightly fasten the plaster on the damaged area.